. : What is Tooth Sensitivity and Why Does it Hurt? What is Tooth Sensitivity and Why Does it Hurt? It’s that twinge or stab of pain you feel when you’re trying to eat some ice cream, or enjoy a coffee, or even when you’re just brushing your teeth. Tooth sensitivity, also called dentinal sensitivity, affects nearly one out of three adults. Symptoms may surface as early as your mid 20’s. 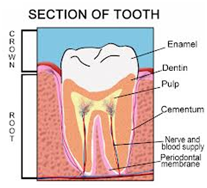 Pain occurs when the enamel (the protective coating on your teeth) has worn away or when your gum tissue recedes, exposing the inner layer called dentin. Without the protective layer of enamel or gums, painful sensations can travel more easily through the tooth to its sensitive nerve centre. Erosion starts with the everyday wear and tear of chewing and brushing and can worsen when dietary acids found in citrus fruits and drinks and carbonated beverages accumulate on your teeth, softening the enamel. Or you may be one of those people whose tooth enamel is just naturally thin in places. How to prevent and treat tooth sensitivity? Welcome to “Pearly White Smiles” - our New Dental Hygiene Clinic for all ages, where people will be able to smile more. Our clinic offers the highest level of care at affordable prices in a friendly, yet professional atmosphere. A Dental Hygiene Clinic is an office operated by a registered Dental Hygienist, whose scope of practice is prevention of oral diseases such as gingivitis (inflammation of gums caused by bacteria) and periodontitis (deterioration of bone which leads to loss of teeth).